Your secret hideaway in the heart of town – hidden from the world, yet a world of its own offering serenity and space, privacy and perfect peace. 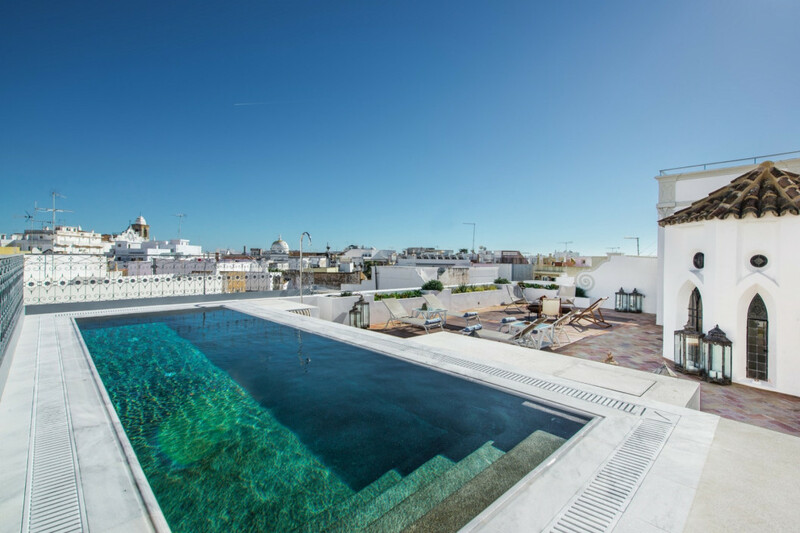 On the roof is a pool and place of sun-worship, with eternal views over rooftops; yet up here the busy world is hushed and total relaxation is yours for the asking. For socialising, the rooftop becomes a mellow cocktail bar at sunset, whilst intimate dining awaits, al fresco, up here under the stars or inside the house. For larger parties, seat up to two dozen under ancient stone arches in the wine cellar – yet another treasure in this hidden house of many magnificent rooms. Located in the heart of Olhao’s old town, markets and restaurants are within walking distanceas well as ferries and water taxis to the outlying islands. Also no more than fifteen minutes drive from Faro airport. Moorish design / modern villa. There is a roof top pool (9mx3m) which can be heated upon request, multiple terraces and outdoor sitting areas and a garage with space for one car. The kitchen opens onto a large terrace with tables and seating for 24. There is a charcoal BBQ and separate open fireplace to extend the dining out season. There is a meditation room & two massage/treatment rooms, a games room with a pool table, a laundry room and a large winter living room with open fireplace and connected library opening onto a central courtyard. Air conditioning is where it's needed, not everywhere in the villa. The old house design included clever use of natural ventilation, which is taken advantage of and boosted with ceiling fans (high quality and silent). There is also underfloor heating throughout. There are twelve double bedrooms, each with a large ensuite bathroom, with walk-in shower, and in one, with an additional free-standing bath. Nine of the twelve bedrooms have the flexibility of being twin rooms. There is a large contemporary domestic kitchen. There is another industrial prep kitchen on the ground floor. Air conditioning, BBQ, Heated pool, Balcony, Terrace, Games room, Pool table, Dishwasher, Parking, Wi-Fi*, Roof terrace, Heated floors, Bar, Fireplace, Laundry facilities, Fridge/Freezer, Hob/Stove, Microwave, Iron, No TV's, Pool towels, Sun loungers. Children under the age of 8 are unable to stay at this villa due to the rooftop location/balconies of the villa. Maid service is five days per week (except bank holidays). Fresh towels twice per week and fresh linen once per week. A chef can be arranged on a part time or full time basis for the duration of your stay.